Wicklewood towermill on the Hackford Road stood just off the road on the west side of the village. The three storey mill used patent sails turned to wind with a fantail, to power 2 pairs of French burr stones, a flour mill and jumper. A Baking Office was run from the mill site. The brick tower was around 25 feet high and the walls were 27 inches thick all the way up. There were two doors at ground level, one on the east side and one on the west side. A 3 ft. diameter wood crown wheel took the drive from the upright shaft to power the sack hoist etc. via a lay shaft. A Capital Freehold Brick Tower WINDMILL at WICKLEWOOD, with two pair of French Stones and Flour Mill, with complete set of Winding Tackle and Patent Sails. Also an excellent Freehold Dwelling house and other outbuildings and one rood and 21 perches of Land near the Mill. Wicklewood is a good bag and retail country, three miles from each of Wymondham and Hingham and eleven form Norwich. A Capital Freehold BRICK TOWER WINDMILL with two pair of French Stones, Flour Mill, with complete set of Winden Tackle and Patent Sails, situate at Wicklewood, in the occupation of Robert Howe. Also an excellent Dwelling house with Bake Office in full trade and one rood and twenty perches of Freehold Land. 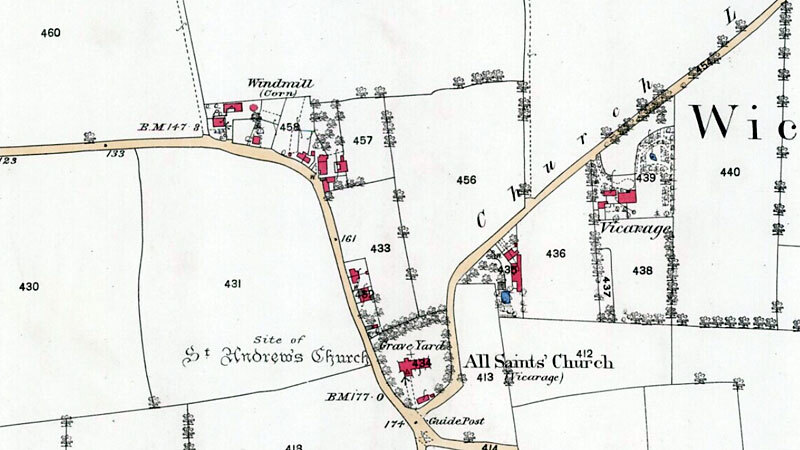 Also a Brick and Tiled Cottage and one rood of Freehold Land near the above Mill. Wicklewood is a good Bag and Retail Country, three miles from Wymondham and three from Hingham. Apply to Messrs. Goldson & Son, Solrs. East Dereham or to Michael Hardy, Gressenhall Mill, near East Dereham. A Capital Freehold BRICK TOWER WINDMILL with two pair of French Stones, Flour Mill complete, set of Winding Tackle and Patent Sails, eligibly situate at WICKLEWOOD in Norfolk, with a convenient Brick Tiled Dwelling house and Baking Office and about one rood and twenty one perches of Land adjoining of all of which immediate possession may be had. Also a detached Brick and Tiled Cottage and one rood of Freehold Land. Wicklewood is a good bag and retail country, 3 miles from Wymondham and 3 from Hingham. Apply to Mr. M. Hardy, Miller, East Dereham. A Brick TOWER WINDMILL and a Dwelling House, Baking Office, the Mill is one of the best Bag Mills in the county, situate at WICKLWOOD 3 miles from Wymondham and 3 from Hingham. Apply to Mr. Hardy, Miller, Dereham or Mr. Goldson, Solr. East Dereham. A SUBSTANTIAL BRICK TOWER MILL, with a convenient DWELLING-HOUSE, Stable, Yard, Garden and apart of the Garden Ground at the back of Lot 2, as staked out; in the occupation of Mr. MICHAEL HARDY, Tenant from year to year. The Mill stands remarkably well for wind, within equal distances from Wymondham and Hingham, has 3 floors, patent sails, winds herself, drives 2 pairs of stones, with flour mill and jumper, and all her going gears complete, and in full trade. A Brick and Tiled COTTAGE adjoining the Mill Yard, and a piece of Garden Ground, extending backwards 72 feet from the front of the House, now in the occupation of JOHN BUTTON, Tenant from year to year. The Purchaser of this Lot is to raise a fence separating the Garden Ground sold therewith from Lot 1. A substantial Brick TOWER WINDMILL, Dwelling house, Cottage, Stable, Yards and Gardens in the occupation of Mr. Michael Hardy and John Button. The Mill stands remarkably well for wind within equal distances of Wymondham and Hingham, has three floors, Patent Sails, winds herself, dries two pairs of stones, with Flour Mill and Jumper and all her going Gears complete and in full Trade. A SMOCK_WINDMILL with DWELLING-HOUSE, Baking Office, Stable, Garden and piece of Land adjoining, situate at Great Bittering, adjoining the public road and near Gressenhall Fairstead, in the occupation of Mr. John Hannant, whose tenancy expires at Midsummer next. The Mill winds herself, drives 2 pairs of stones, with flour mill, jumper and all her going gears complete. The Baking Office is adapted for carrying on a considerable business and is in full trade. On Friday 16th February 1844, the mill was sold for £490 at auction. The reserve was £400 + 10 / £370 + 60. The annual rent was £20 / £24. The cottage was sold for £80.00. Thomas & John Button, Millers of Wicklewood, in the county of Norfolk, have by mutual consent Dissolved Partnership this first day of September 1857 and request that all debts due from the said Firm be sent to Mr. Thomas Button of Wicklewood, that the same may be discharged and all debts due to the same to be paid to Mr. Thomas Button on or before the 11th day of October next, or proceedings will be entered for the recovery of the same. Catalogues to be had at the Place of Sale and the Auctioneers' Offices, Wymondham. One Mile from Kimberley Station and Four from Wymondham. At 3 o'c in the Afternoon, in One Lot. In September 1974, Mrs. Sybil Smith of Wighton (b. c.1896) wrote to Harry Apling. By 1980 the tower had been truncated to 3 storeys and painted black with a felt roof with skylights and a chimney. A new house had been built that incorporated the mill. Attractive Character Residence ... converted from a former windmill and granary. 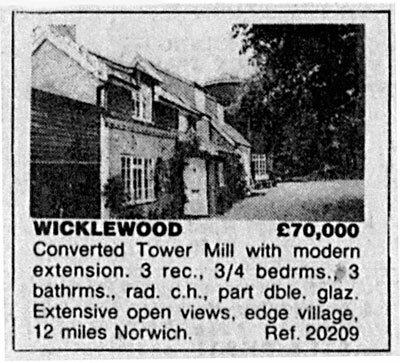 The EDP advertised the property again on 29th November 1985 at the reduced price of £66,500. The mill was converted to residential use by Cordy & Son of Hingham in 1974. The eastern entrance door was blocked up. The western entrance was used to connect the mill to the house built alongside. Additionally, an entrance on the 1st floor of the mill was connected to the 1st floor of the house. Half a Peak stone was incorporated to form the hearth in the mill. 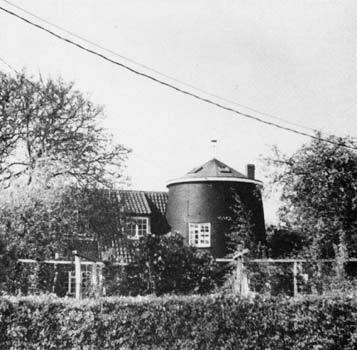 Wicklewood had a second towermill that was taken over by the Norfolk Windmills Trust, with restoration commencing in 1979.